That idea that Donald Trump is softening his immigration policy: Not going to happen. The Republican presidential nominee on Wednesday re-upped the harsh immigration rhetoric that electrified his primary campaign, vowing “no amnesty” for undocumented migrants living in the United States and promising to build a “beautiful” and “impenetrable” border wall that Mexico would pay for — hours after that country’s president vowed that it wouldn’t. 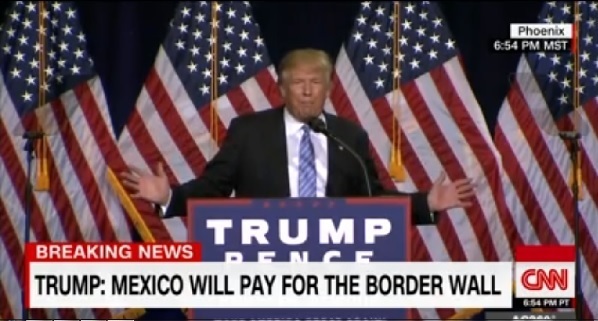 “This election is our last chance to secure the border, stop illegal immigration, and reform our laws to make your life better,” Trump said in Phoenix at the end of a dizzying day in which he made his first foray into international diplomacy with a visit to Mexico City, then baited a fired-up crowd with red-meat rhetoric. On what might have been one of the most important days of his presidential campaign, Trump appeared to be recommitting his electoral fate in November to the white conservative base voters who swept him to victory in the GOP primary rather than seeking to broaden his base to a wider coalition of Americans. Still, adding to the uncertainty that has clouded his immigration plan in recent days, Trump did not give a definitive answer about what he would do with most of the 11 million undocumented people who are not criminals, leaving open the possibility they would have to continue to hide in the shadows. But it was the tone of Trump’s speech that was most notable. “This is it. We won’t get another opportunity — it will be too late,” he said in a speech that recreated the vision of a dystopian, crime-riddled nation on the edge of an existential crisis that he deployed in his convention speech in Cleveland in July. He vowed to create a “deportation task force” within the Immigration and Customs Enforcement division “focused on identifying and quickly removing the most dangerous criminal illegal aliens in America.” He said he would boost the ranks of enforcement agents to enforce existing laws. He vowed that any undocumented immigrants who are caught crossing into the US will be “detained until they are removed from our country” and sent back to their country of origin. And he promised to repeal President Barack Obama’s executive orders shielding some younger undocumented people, including those born in the United States — so called Dreamers, from deportation.